Slightly later than planned, we bring you a week of posts dedicated to women in positions of authority starting with a guest post by Memory Scarlett. Memory Scarlett reads a lot of comics. She writes about the experience on her blog, In the Forest of Stories, and tweets her comics-related feels on Twitter as @xicanti. She’d very much like to be BFFs with Carol Danvers and Jessica Drew. Carol Danvers, codename Captain Marvel, isn’t just a superhero with stellar powers: she’s also an army officer with a talent for command. 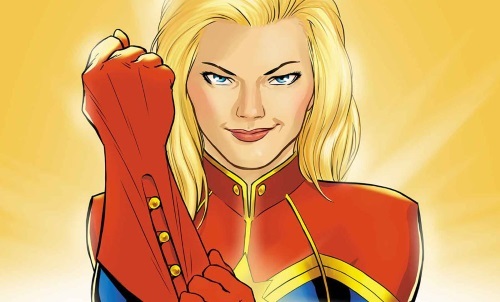 Whether she’s heading the Avengers, as she does at the beginning of Brian Michael Bendis’s run on Mighty Avengers, or serving as the organization’s ambassador to the stars, as in Kelly Sue DeConnick’s most recent Captain Marvel series, Carol takes charge. She’s earned the right to call herself Captain, and she keeps on earning it every day of her life. Our next guest post comes from Lady Business regular, Memory Scarlett. Memory writes about books, television, and more at her blog, In the Forest of Stories. You can also find her moaning about her taco addiction and her various fictional preoccupations on Twitter as @xicanti. She’s currently trying not to dive straight into an epic BTVS rewatch; when she loses the battle, Twitter will be the first to know. I love a good villain as much as the next person, but I usually draw a blank when people ask me about my favourites. So many of the evil folks I latch onto are really antiheroes; the sort of characters who could just as easily switch sides, if they thought it might be to their advantage. They do ghastly things, but since they can also be sympathetic there’s always that small hope they’ll recognize the error of their ways and, like, stop being evil. It’s rare for me to get truly excited about an out-and-out villain. Glory, the antagonist of Buffy the Vampire Slayer’s stellar fifth season, is the exception. She is an unequivocal villain, and I love her to death. Prior to Glory’s arrival in Sunnydale, the Scooby Gang deals with an assortment of down-to-earth villains including vampires who want to eat all the humans; unsouled ex-lovers with psychological torment on their minds; immortal sorcerers who lust after demonic levels of power; and governmental agencies bent on scientifically qualifying magic. They’re great villains, yeah, and they pose a real threat to the Scoobies, but not a one of ‘em is on the same level as Glory. She might deign to wrinkle her nose at them, or shoot a snarky comment their way if they’re particularly lucky, but that’s about as far as Glory would ever involve herself with that sort of rabble. Because Glory is a god. Literally. And she’s not just any old god--she’s a mad, banished hell god determined to return to her realm at any cost. She’s the worst, and that makes her the best.